Mes chéris, what’s delicate, romantic, coquettish, and playful? Ruffles, of course! As I always say, a well-placed ruffle can turn something drab into fab, and now one (1) of you pretty, pretty princesses has the chance to take home your very own bit of flirty fabulosity via DownEast Basics’ Real Ruffle Tee courtesy of J.E.M. Apparel! That’s right, lovers! Café Fashionista has teamed up with J.E.M. Apparel to bring one (1) lucky lady the pretty in pink, slightly sheer DownEast Basics Real Ruffle Tee – a standout style that will dress up basic denim like a dream, and make you feel downright sophisticated and elegant whenever you don it. ♥For one (1) entry Like J.E.M. Apparel on Facebook between now and Friday, September 16, 2011 at Midnight PST. ♥For two (2) entries, leave a comment on this post stating what your favorite J.E.M. Apparel item is between now and Friday, September 16, 2011 at midnight PST. ♥For three (3) entries, Tweet about this giveaway, and leave a comment on this post stating what your favorite J.E.M. Apparel item is between now and Friday, September 16, 2011 at midnight PST with your Twitter URL. ♥For four (4) entries, become a follower of Café Fashionista on Blogger/Google Reader/Google Friend Connect, or Twitter @cafefashionista, and leave a comment on this post stating what your favorite J.E.M. Apparel item is between now and Friday, September 16, 2011 at midnight PST (if you are already a Café Fashionista follower, please say so in your comment). I will randomly pick one (1) name out of a hat (who knows, it could be yours! ), and announce the winner on Saturday, September 17, 2011. Thanks to J.E.M. Apparel for the picture. Amaazing give away from J.E.M.! I love the ruffle cropped cardi! Wow, this is great! Great Giveaway! Lov'n the mini ruffle cardigan! Sweet giveaway. Oh so pretty! Love the long cardi coat! Oh My! What a beautiful frosted flowers cardigan! At J.E.M. My favorite item is the Ruffled Tunic. Thanks I love J.E.M. Apparel and the cropped ruffle top! I'm a J.E.M. Apparel Facebook fan! Such a cute t-shirt! Amazing giveaway doll! Love this giveaway Erika! I will tweet it of course! Have a lovely weekend! oooh this top is so my vibe right now! i want it bad! so gorgeous. i'm in love. I "liked" J.E.M apparel on FB, and I love the wide strap maxi dress. I think it was love at first sight. I am going to tweet about this. My twitter name is @natashahollerup. Enjoy your holiday, doll. I like JEM on FB!! Liked them on Facebook & I love this top! Love the floral print trench coat!! So pretty. It looks like it could also play the part of a micro miniskirt! You can win one of our handmade Doll joining our giveaway! I Like J.E.M. Apparel on Facebook. My favorite item is the bow tie cardigan. I follow you on twittr. 1- i like the Thick Knit Cardigan! 2- i like the Thick Knit Cardigan! I liked JEM on facebook. I follow you through GFC and twitter. 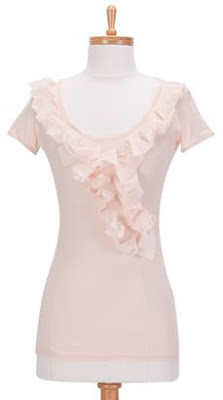 Love the ruffled shoulder sleeveless top! Great giveaway!